That would be Husband and me: primed to save on our heating bill but unprimed as to how. Enter Topher Belknap, Habitat for Humanity, Midcoast Green Collaborative and Round Top Farm. Mr. Belknap introduced his design for interior storm windows at the 2nd Annual Midcoast Sustainable Living Expo, to enormous acclaim. The Midcoast Green Collaborative estimates that 10,000 windows have been built to his design, by and for Mainers. We built 2 of them. 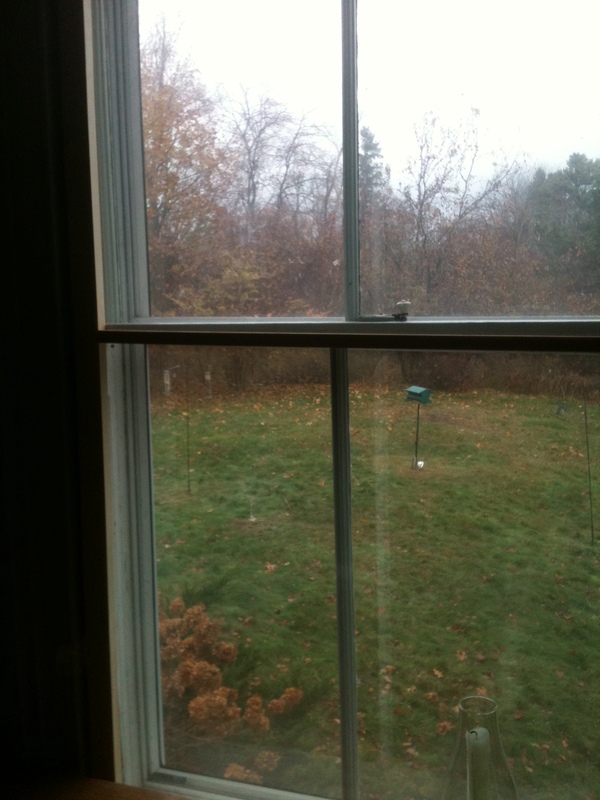 We were first told of these interior storm windows by our locksmith. One of the advantages of moving and having contractors in your house, is the constant recommendations for who you need to meet, places you need to go, and things you need to do. 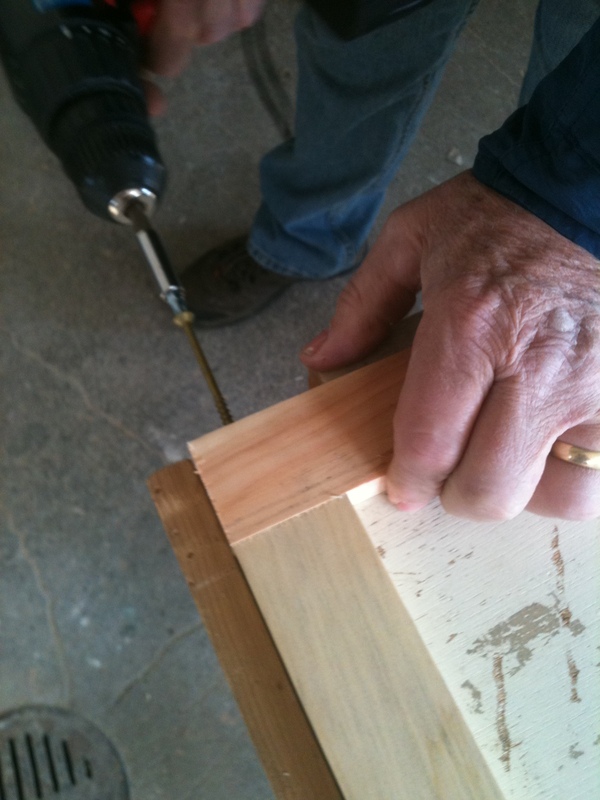 The locksmith advised us on weather-stripping our rattling doors, and that led to a discussion of heat loss, and that led to the workshops on how to build interior storm windows. The workshops are free, held every Saturday morning, and are run with the precision of a finely tuned engine, or an efficiently sealed window, take your pick. We arrived armed only with a piece of paper with window measurements. Six other people attended, a varied assortment of folks, mostly first-timers like us, and a few repeaters. Topher asked the first question: Primed or Unprimed? 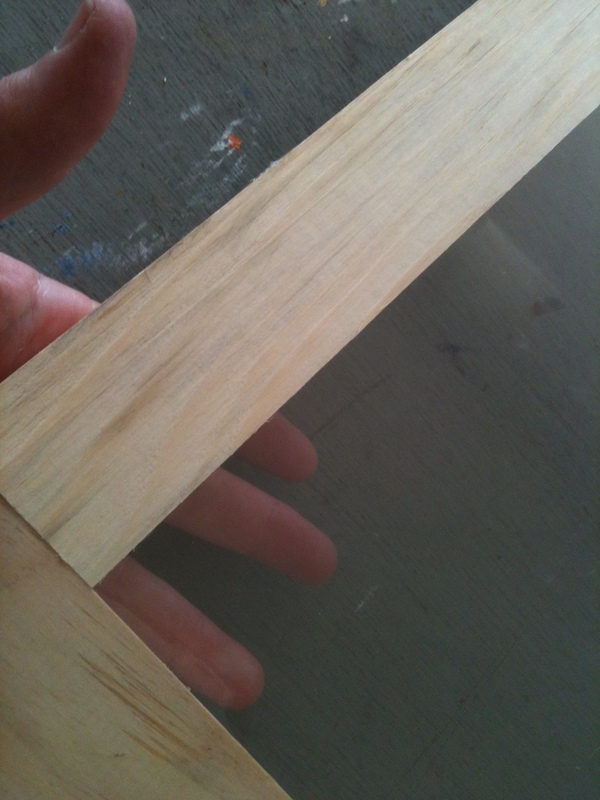 That was the wood frame – and we chose unprimed for our first window. It seemed the basic, sensible choice. (We’re trying to fit in here, in basic, sensible Maine.) 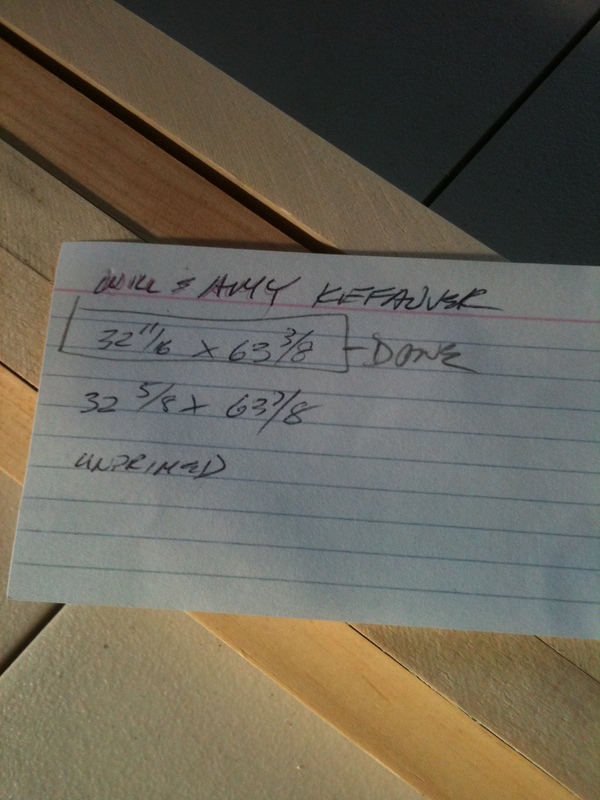 There was a stack of 1 x 2’s, and because our window is large (height = 63”), we also needed a 1 x 1 for a mid-frame brace. 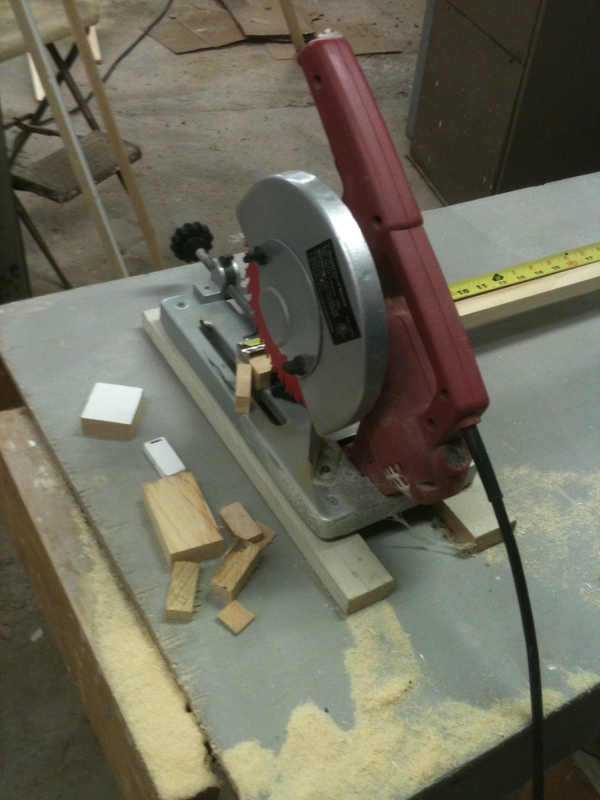 Everyone grabbed their lumber, and Topher cut the pieces for us. Because the frames would ultimately have ¼” weather-stripping on all sides, he had a jig ready that subtracted ½” from our measurement. The lumber was quickly cut. 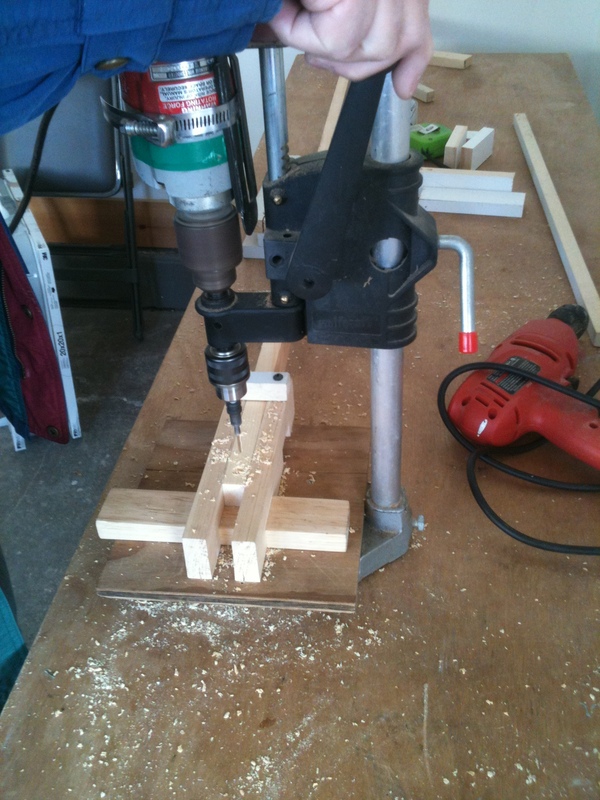 The frames are assembled with two long screws at each joint. 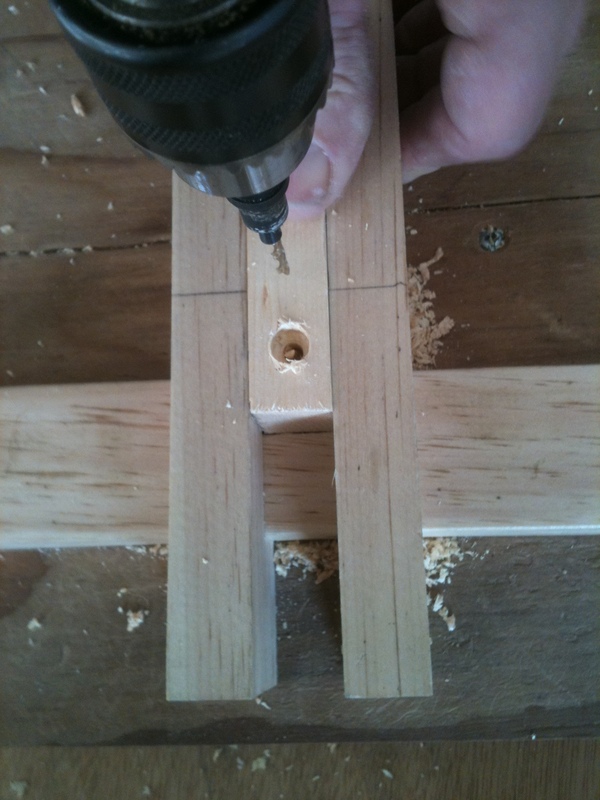 Again, jigs made drilling these holes so easy – Rookie-Proof. Please note: I had an advantage over all of the other attendees: Husband. 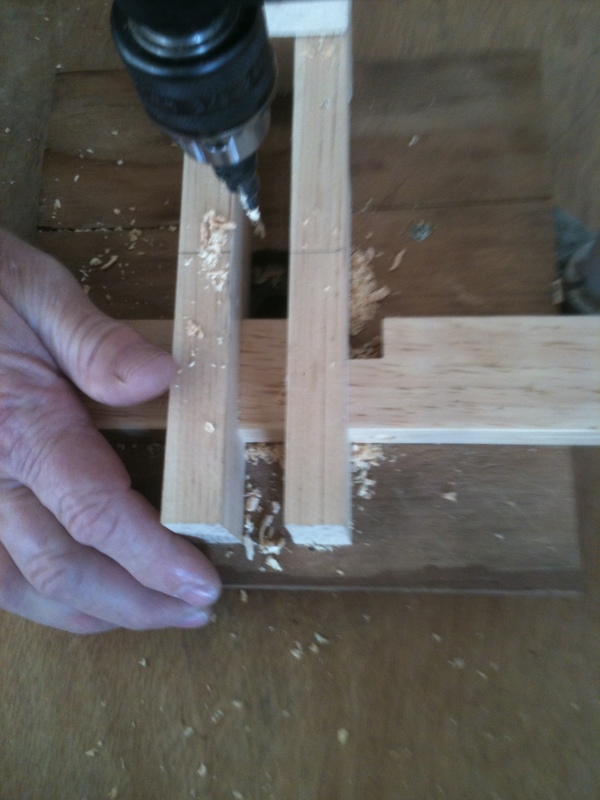 He is a skilled and artistic woodworker. He just “got” the concept, and took off. I was the Cheerful Lackey. Next came a critical decision: deciding the front and back of the frame (knot holes, and whether you think they are attractive or not, played a big part in this), and labeling the window’s location in the house (to make it easier to re-install next autumn). Done and done. 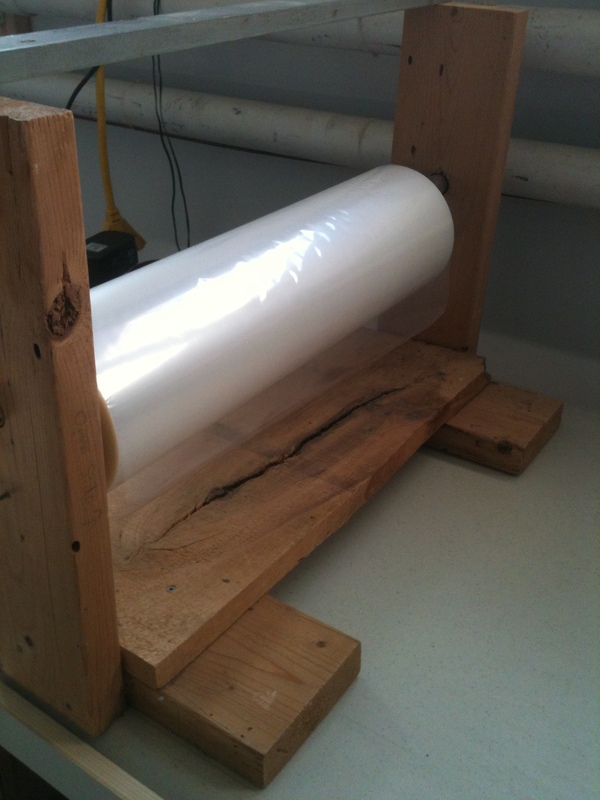 We cut the plastic, unfolded its 40” width, and (“Seam up! Seam-side up!”) carefully stretched it taut and laid it down onto the tape. 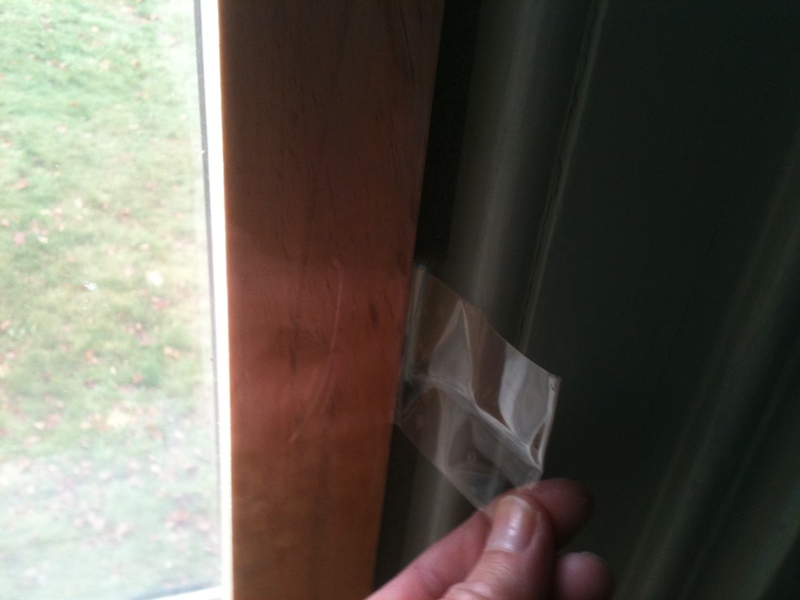 The plastic is applied to both sides of the window. Next came the hair blower, and we watched all of the wrinkles shrink away, and the plastic tighten on the frame. Those are my fingers, as seen through two layers of plastic sheeting. The clarity will be welcome when the window is installed – we will still have good visibility through the window this winter. 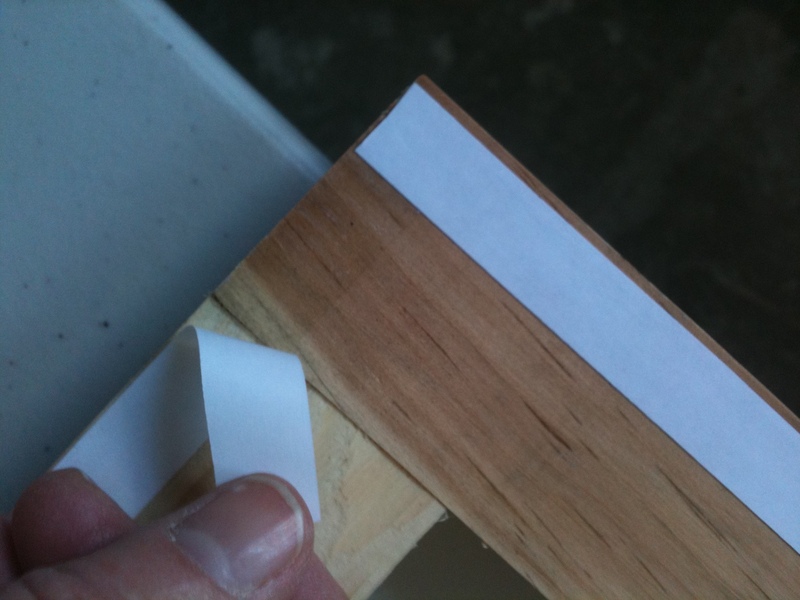 Clear 2” packing tape applied on all 4 sides of the frame sealed the edges. Next came the tabs that will be so useful when taking the window OUT next spring. 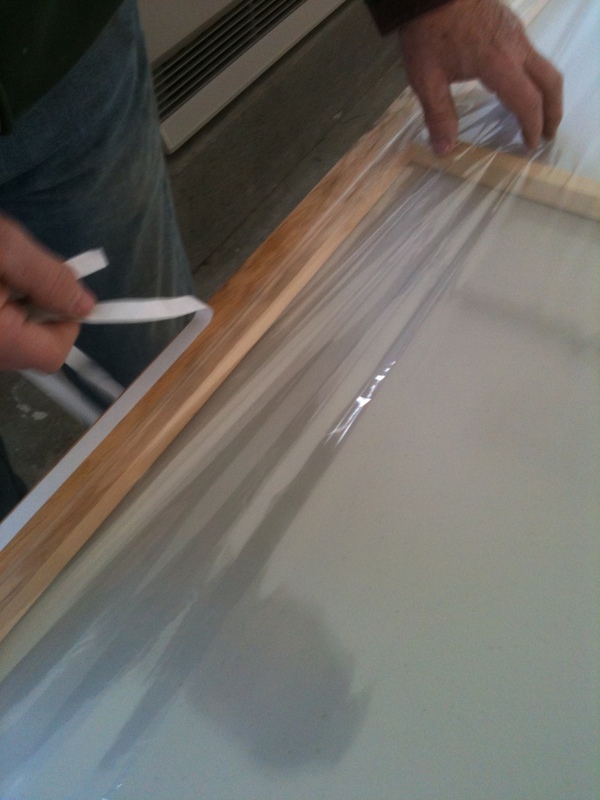 Each tab is just a strip of packing tape, folded in the middle with the two ends attaching to the frame, about 10” from the bottom. 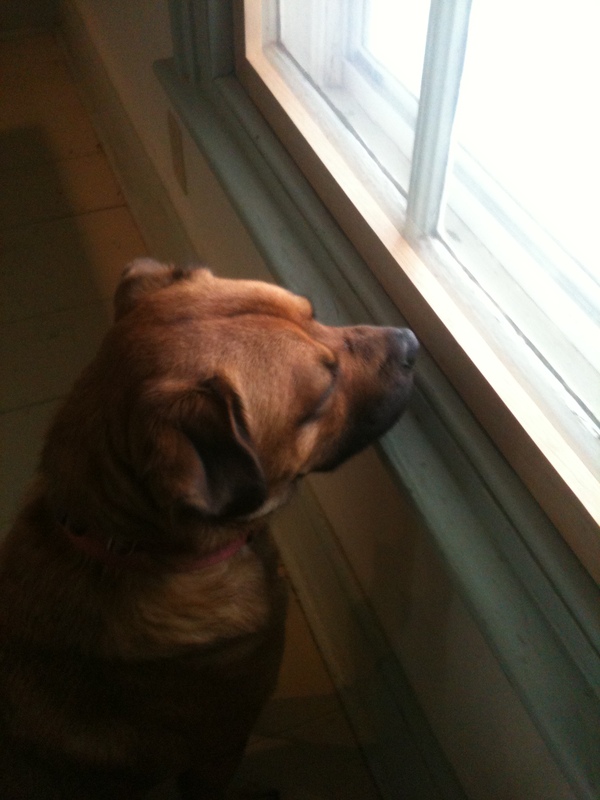 Cost for a 33 x 63” interior storm window? $20. An incredible bargain! We immediately made a second window, and the workshop ended. We took our window home and installed it. We think it looks very nice, and I swear, the room feels warmer already. A look through the window, with the brace featured. Our view, through the double-plastic’ed interior storm. I think it’s just fine. 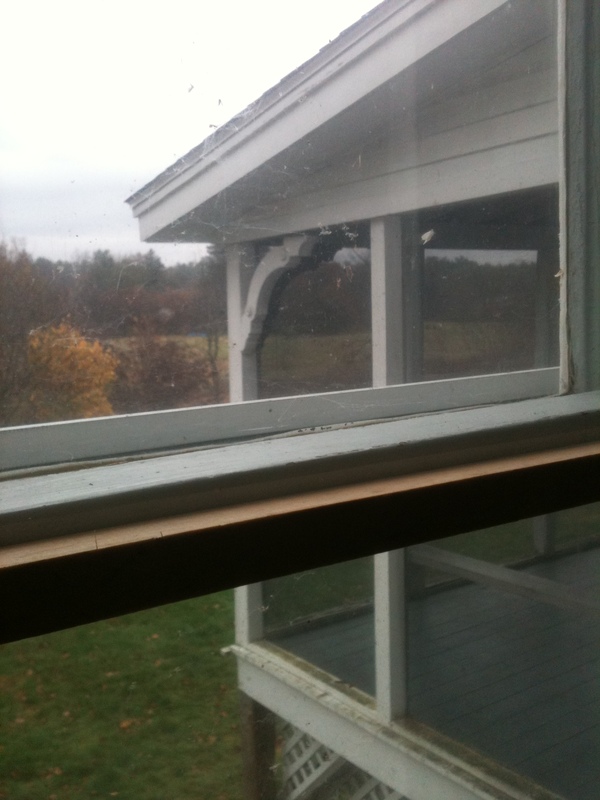 Gordon gives the new storm window his “I can still see the chipmunks through this stuff” Seal of Approval. That’s the good news. The bad news? We have 22 more windows to go. 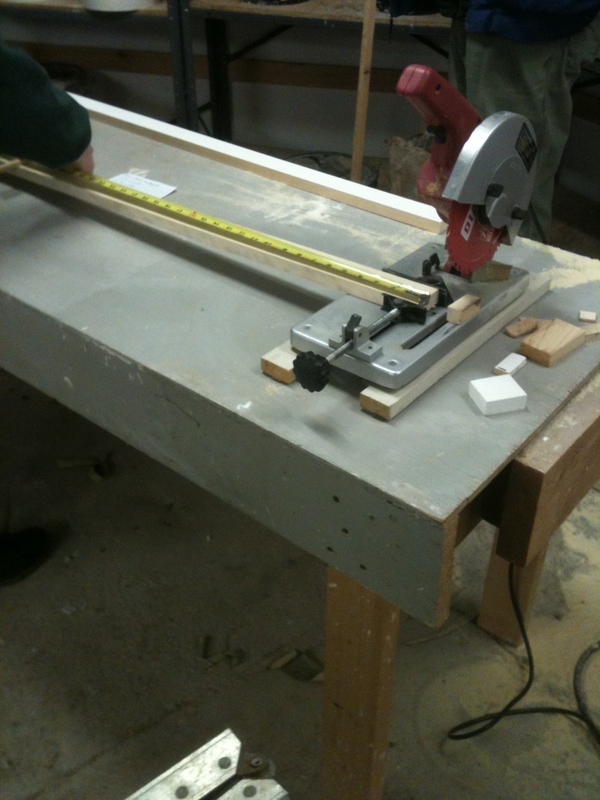 The only way to build that many before spring returns is to buy the material from the collaborative (they buy in bulk and pass the savings on to us), and build the windows in our basement workshop, instead of building them two-at-a-time each Saturday. Another obstacle is Husband. He’s decided Primed/Unprimed is not an acceptable look for the frames, and he’s already planning to paint each frame the same color as the window trim, so that it looks better. I appreciate that, but am once again reminded that Life with an Artist is always beautiful, but never easy. This sounds amazing. The numbers are daunting, though. Wishing you guys a cozy winter!